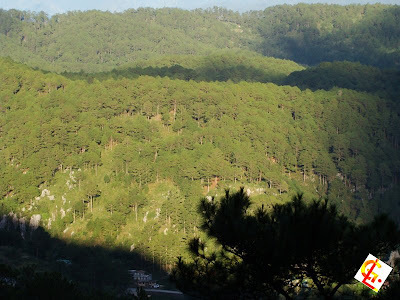 Sagada has a mountainous terrain. It has gentle to very steep slopes with many portions of gradually sloping valleys in the west-central and northeastern areas (see the Digital Elevation Model below which was created from a Shuttle Radar Topographic Mission data and draped with a Landsat 2002 image. Place names were included as reference). Elevation ranges from 1,313 meters above sea level along the Tetep-an Sur-Bontoc border and 2,318 meters above sea level in Mount Kaman-engel. “Sagada is a tributary of the Chico River. There are two major river systems in the Sagada ancestral domain. One starts from the northern area, runs through the Bomod-ok Falls and passes through the eastern area. The Mabileng Irrigation, the largest irrigation system in Northern Sagada is sourced from Bomod-ok and irrigates the payeos(rice paddies) in Aguid, Pide, Fidelisan and Tanulong. The other system starts from Bangaan, traverses the western baranggays through the southern area and eventually connects to the Chico River at the junction in Malitep.